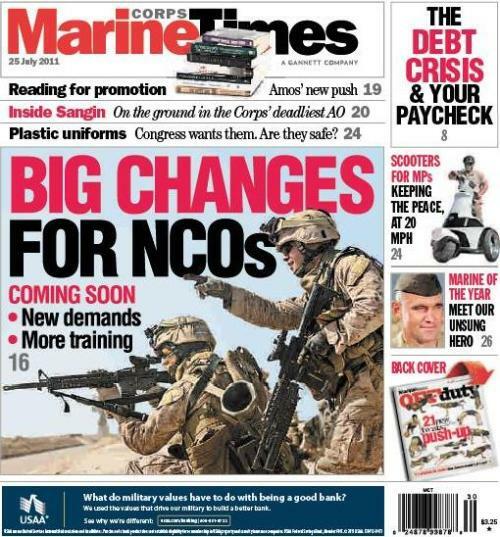 This week’s Marine Corps Times cover story gets to the heart of the newspaper’s audience: It focuses on changes coming for non-commissioned officers, and the junior enlisted Marines they lead. The lengthy story outlines plans that are underway this summer to reconsider the NCO’s role in the Corps. Of course, they’ll still serve as the backbone of the service, but top leadership has moved to sharpen it. That could mean big changes for infantry NCOs, in particular, but changes to training and education could stretch well beyond that. Th new edition also includes an account from Sangin, Afghanistan, where senior writer Gina Cavallaro and photographer Tom Brown recently returned from an embed with 1st Battalion, 5th Marines, out of Camp Pendleton, Calif. They share the latest, with candid comments from the battalion’s commanding officer, Lt. Col. Tom Savage, and rank-and-file Marines. To check it all out, look for Marine Corps Times on newsstands or subscribe here and read it now.